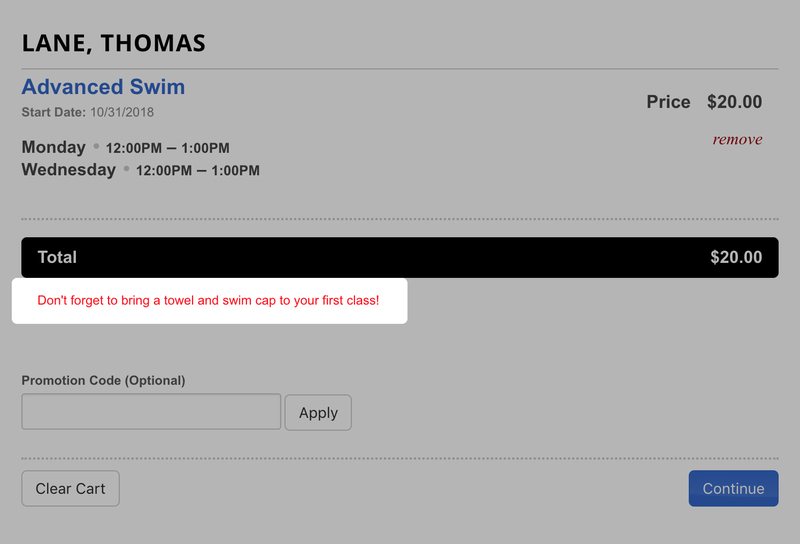 The Custom Message on Cart setting allows you to display a custom message in the Parent Portal Shopping Cart. This allows you to communicate important information to your customers before they check out. This message will appear just below the Totals Bar during the checkout process. We've also added a Hide Totals Bar on Shopping Cart When Every Item is $0.00 setting. This will allow you to enable or disable the Totals Bar from showing when the Shopping Cart is full of items equal to $0.00 (such as enrollment requests, makeups or trials). If there are any auto-approved enrollments in the cart, the Totals Bar will still show and reflect the correct amount for that enrollment. Learn more about these new settings here.